I am one of those guys who grew up with the notion that good pieces of literature / write ups are rare and it takes a full moon with streaks of light, free flow of liquor, few acres of green well manicured lawns and finally the winds playing the notes of Mozart. With this notion I have been whiling away time without writing about my one year well spent at IIMB. Publishing few decent shots of IIMB has been delayed a lot due to this laziness well masked behind such conjured notions. A few years back I applied for this executive management program from IIMB called GMITE - General Management Program for IT Executives with full knowledge that I wasn’t passing the experience criteria. I was just wishfully praying that the selection committee get temporary blindness while going over the experience column on my application, but nothing like that happened and my application was rejected. This program is almost similar to an eMBA or executive MBA. The next year again I threw in the application form sitting at a customer location in Godalming, UK and nothing did materialize. The third year not due to any particular interest but more of a habit I dusted & modified my Statement of Purpose and my Job Profile and filled the application form and sent it across. I remember it was Christmas season and I was in Chennai, the year was 2009. I was checking my mails on the mobile browser and voila I had made it through the selection list. Shock & Surprise were the initial reactions followed by joy, happiness and then finally followed by checking my bank balance for the fee aspect. I was sure I was going to be one of the youngest members of the class at around 4+ years of total experience. Told the happy news to my better half, family & friends and was waiting for the first class to begin in January. Went to IIMB to pay the first term fees and was amazed to see the HUGE (make no mistake H U G E) campus, green (really green), beautiful architecture and bang on the ever crowded Bannerghatta Road. First day was orientation, group photograph, and an awesome session on psychology, human mind & the brain, the session was taken by a qualified doctor from UK. Moral of the session other than lots of amazing facts and informative anecdotes was the fact that the brain can take what ever is thrown to it and hence please learn all the subjects that were to follow in the two semesters. A polite and informative way of getting the point across. The class was a mix of people with varied experience, starting from 3++ to 20+ years of experience. 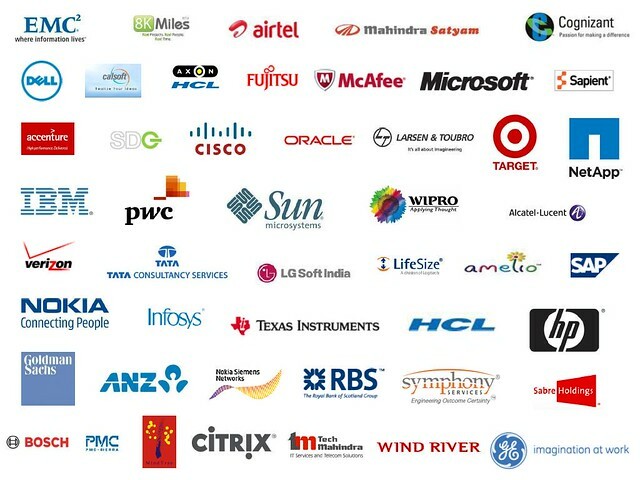 There was representation from about 40+ companies in our batch. 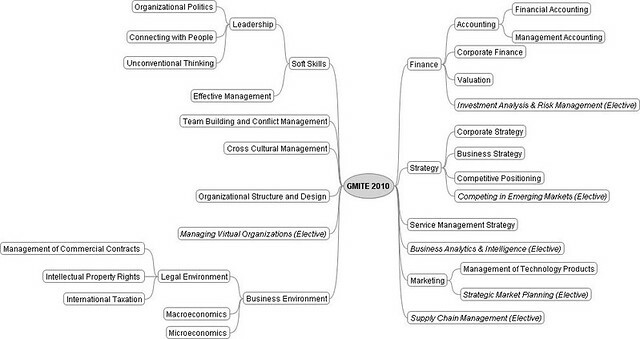 Most of the subjects were core for business, management & career growth. We struggled to understand few aspects of core subjects from the Finance & Economics domain and had to put in quite a bit of effort. Now just looking at this map of companies, you can visualize what kind of perspective, knowledge and experience the group brings to the table during discussions, informal chats and table topics. Mind blowing array of unique work cultures, best practices etc. Every Friday my day started at around 6 early morning to wake up, get ready, check the time table and pack my bag and get to college. Breakfast was at college combined with discussions with friends on the week that went by and the class ahead. We also caught up on several interesting discussions on the entrepreneurial aspirations of many and yes, about the assignments as well. Classes began at 8.00 am and the professors would start their wonderful delivery of the subject. The beauty of such top notch colleges stem from none other than the professors and the students. The professors were unbelievably awesome and yes we students were decent too (hope so :P). It was tough during the initial few weeks to get used to sitting long hours at one place and listening to lectures, it was like we were revisiting school after gaining some experience. We also used to have some eventful discussions moderated by the Profs. Then slowly the assignments started, few assignments used to take up weekends and threw my travel schedules out of the window. After class we used to be treated to some soulful food, it was some kind of penance from the college for the day long sessions. After that I used to leave to office.It was quite strange to reach office at 3.00 pm as it was the time people generally leave on Fridays. I used to walk into office amidst a few weird glares from people. Eventually May came and my birthday went without a big bang as it was also exam time, nights became short, coffee became stronger and my eyes widened. I somehow managed to do decently well in all my papers. A week or two was our holiday break a.k.a summer vacation. We were back to campus and the same schedule started and before we realized we had hit upon the electives. I chose Strategic Marketing and Business Intelligence and had fun. The Final week was hellish and had few friends compare it to the Army Hell Week. We had classes in the morning and exams in the late evening. I travelled around 400 kms in one week, my day used to start at 5:30, used to get ready and reach college and we used to have class from 8 -5 and then exams from 5:30 - 7:30 -- 8:30 and by the time I reached home it used to be 10 and then study for a few hours for the next exam and sleep. Whoa it was fanatical but I really loved and lived up to the challenge. Last few weeks, a bunch of like minded photographers got together and walked around campus clicking, shooting, and capturing anything that moved & stood still - almost everything. We couldn’t do too much justice to the great campus of IIMB. Anyways I am sharing the pictures below; please do share your comments and critique. All the pictures and the video have been shot with a 5 year old P&S Canon S3 IS camera. Thanks for reading.